A Moray mum has been given fresh hope her daughter can travel to the US for pioneering cancer treatment after tens of thousands of pounds was donated to a special appeal. Gail Paterson is facing a race against time to raise £100,000 so three-year-old Eileidh can take part in a trial of drugs not currently available in the UK. She feared the worst when the total funds raised stood at just £14,000 a month ago. Eileidh’s future remains in the balance as her final round of high risk neuroblastoma immunotherapy nears completion, because her condition carries an 80% chance of relapse. Ms Paterson, 39, of Forres, said last night said that her faith in her daughter’s future was growing stronger by the day thanks to the “unbelievable” efforts of people all over the world. She said: “It’s looking so much more positive now we are getting closer to the £100,000 mark. “The generosity of people is just amazing. I don’t know where it comes from. “Eileidh’s treatment finishes a week on Sunday, and the closer it’s getting to the end of her treatment, the more real it becomes and the more nervous I’m getting. “Saying that, knowing there is only about £35,000 to go does steady my nerves a bit. “We have had donations from the US. I have been Googling Eileidh’s name and finding her on American websites now. The latest fundraising event involved the Highland Bike team – Steve Taylor, of Stewarton, Glasgow’s Paul Muldoon, Robert Campbell, of Spean Bridge and Kevan Lawler, of Wishaw – complete a treacherous 214-mile ride from Forres to Glasgow on in conditions which were more typical of December than May. With the help of support driver Iain McGovern, of Newcastle, the group raised more than £3,500, and the Patersons met them at their Celtic Park finish line to say thank you. 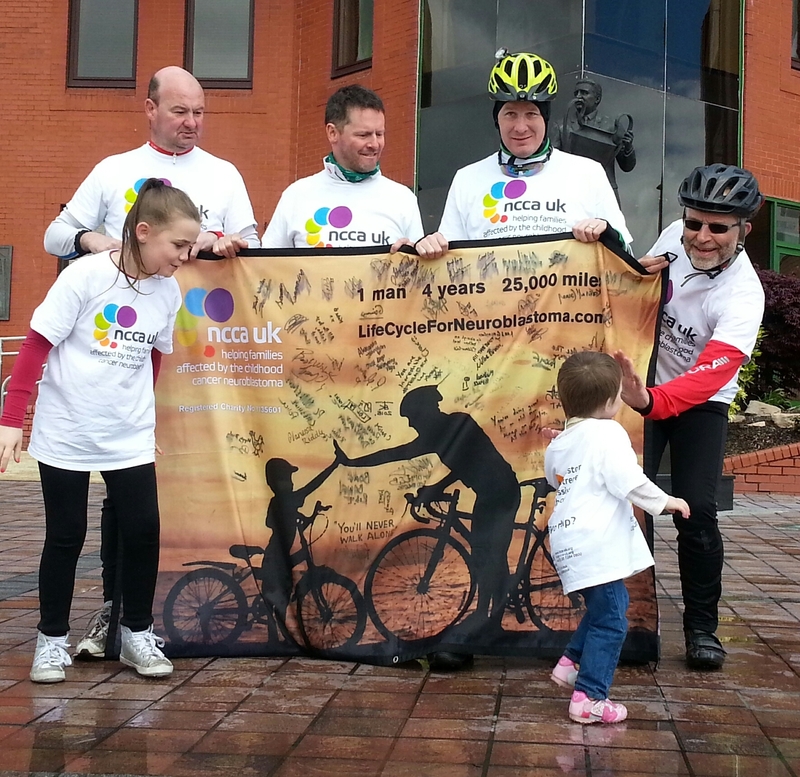 The 62-year-old is a long-term child cancer campaigner and his latest efforts involved him completing the 14,000th mile in his “LifeCycle for Neuroblastoma” quest to bike the 25,000-mile circumference of the earth in four years. He added: “I just want to keep the pot boiling. LifeCycle is an extraordinarily difficult challenge meeting an extraordinarily difficult disease head-on. I am out on the bike every single day at 5am. “Even in the worst conditions, on the days I don’t feel like going, I just say to myself that the driving wind and rain is still better than the needles and everything that these kids have to face. “You just can’t give up because if you go to a kid or a parent of a cancer sufferer, you never hear them say ‘I don’t think I will bother with the treatment today’. If all the money can be raised, Eilieidh will start an eight-week clinical drugs trial – aimed at reducing the risk of relapse – at the Helen DeVos Children’s Hospital in Michigan next month.